The Tibetan Shapale Goes Viral! I wish I’d known this yesterday when I was writing my post but anyway, it’s good to have noted! It doesn’t really explain how come the Shapale video is still easily accessible on the Chinese language video hosting sites but who really understands Chinese internet!? OK I have left the original posting from yesterday unchanged below. It’s been incredible following the journey of a YouTube video made by young Tibetans in Switzerland spreading like wildfire through the interwebs. I might be going out on a limb but I’d go as far as to call the “Shapale Song” the first truly viral Tibetan video! I remember seeing it come out of nowhere, it was literally all over my Facebook from one moment to the next back in March, Tibetans everywhere posting it all over each other’s walls with smileys and <3s and expressions of enthusiasm. For those of you who haven’t seen the video, here it is on YouTube, at the last count it had racked up over 29,542 views! I don’t know how to measure what a huge sum almost getting 30,000 views in a month is… I tried to look on YouTube for an equivalent but couldn’t really come up with anything. So just to compare really roughly, a song that I think is pretty popular and well known amongst Tibetans in exile is Chag Sum Tsel by Phurbu T Namgyal, arguably the most popular singer around (very generally!). His Chag Sum Tsel video on the super popular YouTube channel kept by Jigdo has had 28,563 views – but it has been online 4 years to amass that figure! The whole rap is delivered in impeccable Lhasa Tibetan complete with honourifics! The overall message of the rap picks up on the pride in Tibetanness that upsurged last year in all sorts of ways, we wrote about it on High Peaks Pure Earth but I feel that the Shapale Rap has most in common with the pride and confidence displayed by Yudrug in their rap video New Generation. The comments on the Chinese language sites have been very enthusiastic, praising the video for its originality and fun side! The small update on Weibo below encourages Tibetan rap and wonders about the ethnicity of the singer, speculating he is half-Tibetan! It’s been just over a month now that the video has been online and it’s already a classic. I really can’t think of any other video that has done that. The shapale theme also fits in well with the idea of Tibetan identity assertion taking place through food at the moment that we wrote also wrote about on High Peaks Pure Earth but maybe now I’m reading too much into it. I’m just happy to see a smart, clever and funny video made by young Tibetans strike a chord with Tibetans all over the world! 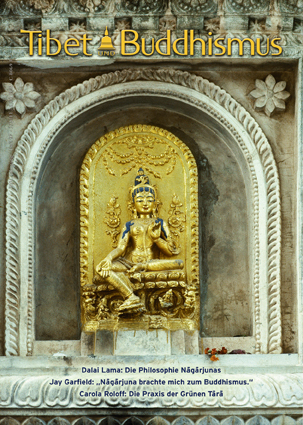 The new issue of “Tibet und Buddhismus” is out and it includes an article I wrote for them called “Tibetische Stimmen aus dem Cyberspace” . At some later point, I’ll post the article here on my blog for the German readers! “Tibet und Buddhismus” is published by the well-established Tibetan Buddhist Centre in Hamburg (Tibetisches Zentrum e.V.) and my association with them goes back a loooong way! It’s so great to see them continuing to combine Tibetan Buddhism and Tibetan politics, they show how both can be done, and done well!!! It may only have been one tweet but it means a lot to have an international musician and artist at least saying something on Ai Weiwei. All hail _M_I_A_ ! 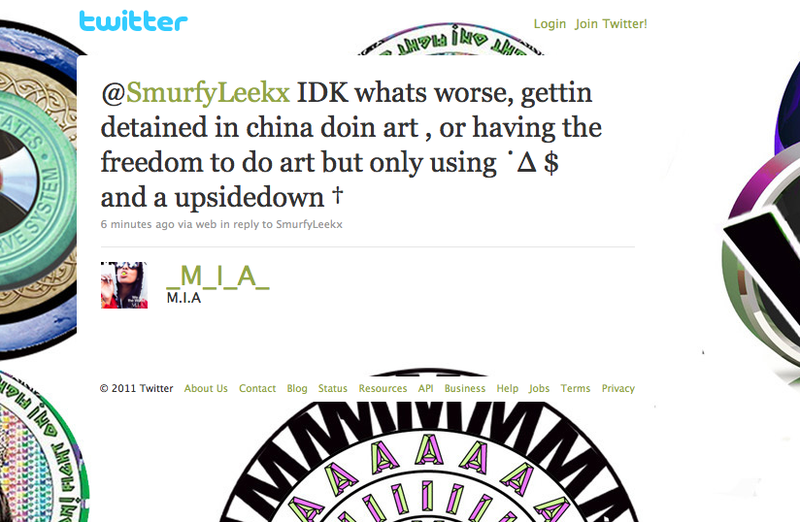 Keep up with the SmurfyLeekx Tumblr in support of Ai Weiwei, it’s going viral right now!! !